Constipation is a common problem and affects most people at some time in their lives. 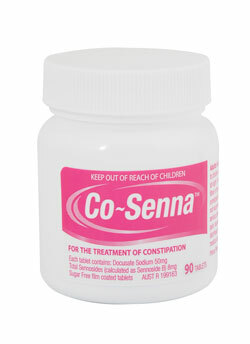 Co-Senna delivers effective relief of constipation with dual action. Co-Senna Tablets contain both a stool softener (docusate sodium) and a stimulant laxative (senna) for gentle, overnight relief of constipation. Each tablet of Co-Senna contains docusate sodium 50mg & total sennosides 8mg. Co-Senna tablets are equivalent to Coloxyl with Senna (Coloxyl Reg TM Aspen Pharma Pty Ltd). Dosage Adults & Children 12 years & over: Take 1 or 2 tablets at night. Increase up to 4 tablets if required. Co-Senna is now available in bottles of 30's, 90's & 200's. Co-Senna tablets are free from sugar, gluten & lactose. Store below 25°C. This medicine may not be right for you. Read the label before purchase. Follow the directions for use. If symptoms persist, talk to your health professional. Do not use if you have abdominal pain, nausea, vomiting or diarrhoea.